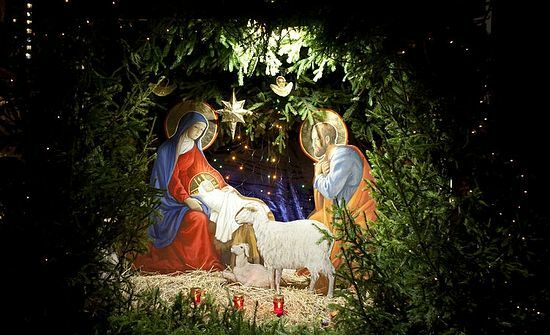 Although in the West we might have some traditions of our own that differ from those in these pre-Christmas notes of a Russian mother, it is wonderful and instructive to read how she prepares her family for Orthodox Christmas. Probably one difference is that now in Russia, the days between New Year’s Eve and Julian Calendar Christmas are national holidays. School is out, and most companies and government offices are closed. After the New Year there are six days left before that feast for which we have been preparing ourselves for several weeks. This is special time. There is a strict fast. There is a break from school, and even the vocational schools are closed. Dad has some days off. And it is all happening at the same time. This only happens once a year. This is a time of strict fasting. This means that there are no dinner parties or big events. There is nothing rowdy. There should only be something calm and quiet. But there is something very special about this, because these days are a well-deserved break. It is a wonderful time, when children do not go to school and their father is home all day. Beginning with Christmas Eve in our home, our lives will be filled with solemnities and festivities. Therefore we had better rest now. It wouldn’t be right to spend these days doing large-scale pre-Christmas housecleaning. It would have been better to do this quietly throughout the Nativity fast. The light fixtures can been cleaned as early as three weeks before the feast, and there is no obligation to clean the drapes on the day before Christmas; the shelves and cabinets could have been cleaned and the dinnerware cleaned off during the final days of December. But during these pre-Nativity days, it should be quiet and clean in the house. It’s the threshold of the feast, and we are all together. Every family has its own traditions. In our house, the time between New Year and Christmas is a time to prepare for the Feast; it is a time for the family to unite, to talk walks, read, and freely occupy ourselves with creative work. And we do it all together. In the morning we read the Gospel, a little more than usual. And there is time to look at the explanations [of the Feast of the Nativity] and discuss what we’ve read. This is the first association with the real holidays, days off, and vacations. We take walks as a family every day—in the woods, or in the park. We go cross-country skiing, ice-skating, and tobogganing. Of course, the weather is not always wintry, but we can always think of something if we want. We absolutely never go to any special entertainment centers, where of course one can relax just fine but at the same time disrupt the quietude of these days. Furthermore our quiet walks, without the fuss associated with distant travel and new places, facilitate our closeness and unite the family. It is an opportunity to not rush anywhere, not get distracted by anything, but just be together. This strict fasting time, which does not allow any active entertainments, gives us the opportunity to spend several days of the of the vacation in our domestic peace. We can go to bed a little earlier—after all, we don’t have to do homework or get our books and lunches together for tomorrow. 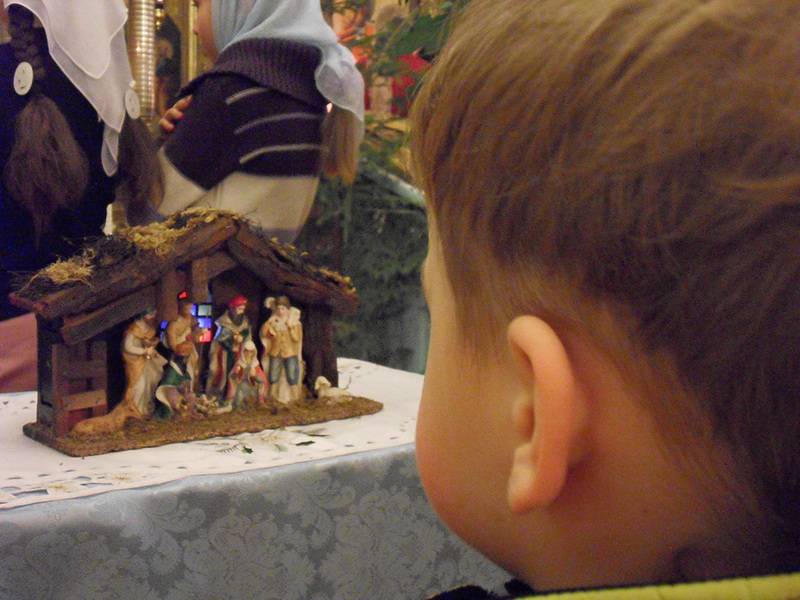 Therefore we read more to the children at night than usual—Christmas stories both Russian and foreign. The Children can’t wait for Christmas to come… And it’s on the way. And we continue to prepare ourselves for it. On each pre-Nativity day we do something together for the Feast. Of course, we do something a little different every year. Here are a few ideas for these strict days of the children’s vacation. 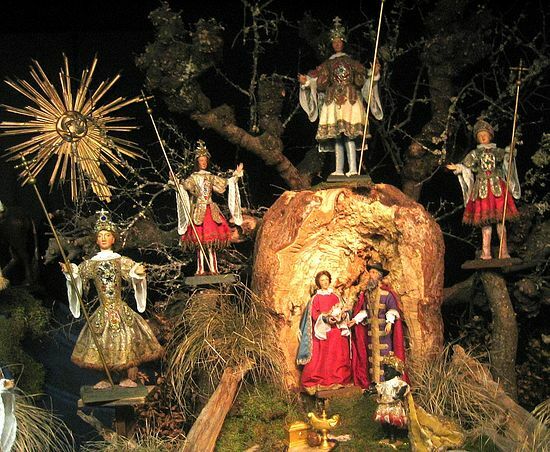 Manger scenes can be made out of paper, plastilene, pine branches, and cardboard—what don’t people use to make them! Our manger scene is made of clay, because this medium doesn’t need to be painted; furthermore clay, as opposed to paper or cardboard, won’t burn. And soft modeling clay for children can be easily found in supermarkets and craft stores. Thus, we need: a kilo and a half (3.3 pounds) of modeling clay, a metal dish or paper (we used the bottom of a spring-form pan), a Christmas card with the Nativity Scene, and a candle to light it. 1. The smallest children can roll out a thick layer of clay. Stones can be pressed in around the edges. 2. The older children make the cave. It’s walls should be very thick; otherwise they will crack when dry. 3. We make a small cradle out of clay. We place a candleholder at the entrance of the cave for a burning candle (we make a holder out of clay to go around the prepared candles). This is the safest option for lighting the candle with fire. 4. We cut the Christmas scene out of the Christmas card; we press it into the base or paste it onto the back of the cave with clay. You can also find figurines of the Mother of God and the Infant in the cradle and put them in the cave in place of the Christmas card. Perhaps the children can even model them themselves out of the clay. My mother used to make figures of the Virgin Mary and the Divine Infant out of sugar. 5. When the clay has completely dried, we light a candle before the entrance to the cave. Note: you must never light a candle before a paper or wood manger scene—paper especially burns up in a moment! Nor should it be done before a playdough or plastic-based medium. That medium can melt and drip on one’s hand, causing sever burns. Therefore only clay or metal will do. We made a clay candleholder for the burning candle so that we won’t accidentally place the candle too close to the cave. 6. Around the cave you can place porcelain angels, animal figurines, shepherds, and magi. You can make a star to go over the cave (for example, you can attach it to the wall behind which the cave has been placed). 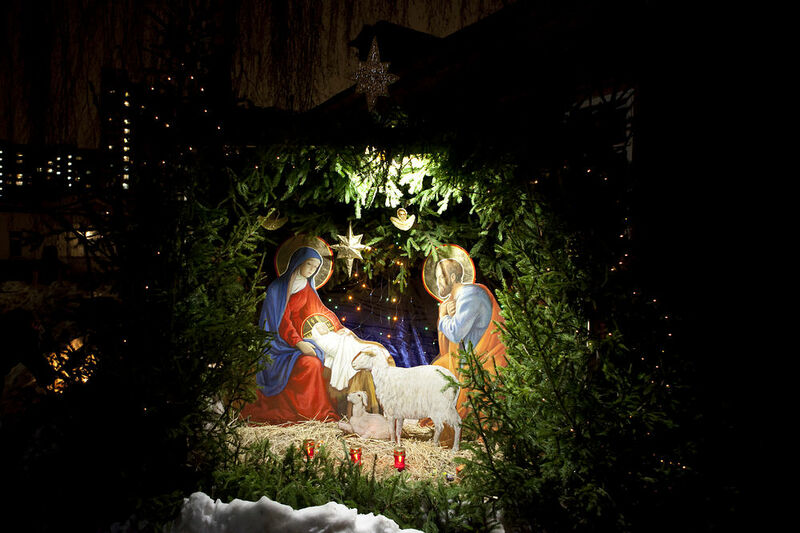 If the ceiling is not high, you can hang the star made of gold-colored foil on a thread over the manger. If there are a few days left before Christmas, we cover the manger with napkins and place it on a top shelf so that it will dry completely. We set it up on the day before Christmas. Figures of magi, shepherds, and other heroes of the Nativity Feast. For Christmas we make a large illustration in our apartment for the Feast. The children draw magi, shepherds with sheep, and angels with trumpets in large format on cardboard. We even draw King Herod and Death, who came to punish the wicked king (according to traditional Russian Christmas plays). We put Herod and Death somewhere in the foyer, so that we won’t run into them at night, while we put the other heroes on the doors and walls all around the apartment. Now we get ready to make the figures out of cloth, like dolls. They can be placed on the Christmas tree or the window. Of course you can buy beautiful Christmas signs made of paper, plastic, or cloth. But if you make them yourself, it will provide yet another opportunity to unite your developmental activities with creativity and preparation for the family holiday. And using Church Slavonic [or Greek, or Arabic, etc.] will help them learn these languages as well. 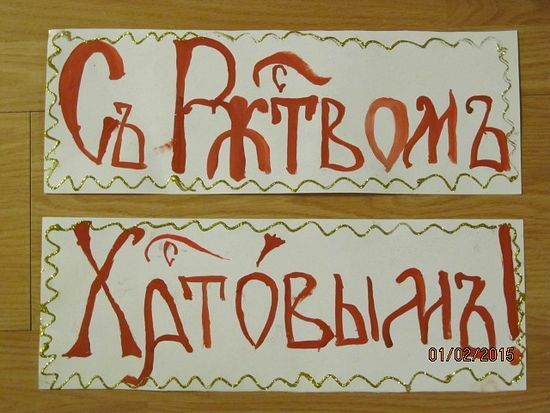 The sign, “Christ is Born!” can be made by children five to seven years old. We take letter-sized paper for tracing or watercolor. We fold the paper in half, and draw one letter on each half. The children color in these letters with crayon or watercolors. The finished letters can be sprinkled with glitter or tinsel. Then we lightly shake the letters to remove excess. Now we have a sparkling letter. The child cuts out these letters and sets up a complete phrase of the sign (learning all the while). The letters can be pinned to the drapery, taped to the wall, or attached to a long piece of tape and hung on the Christmas tree or from the ceiling. The children always make cookies before Christmas Eve. Forming figures, especially cutting them with cookie cutters, is within the capabilities of any two-year-old. But for the older children, it’s an unlimited field for creativity! I make a lot of dough right away. It’s very pliable, like modeling clay. We roll it out in a thin sheet, 5-8 millimeters (about 1/3 inch). Then the children cut it with cookie cutters. Or, you can roll the dough into cylinders and shape it. Pretzels shapes, stars, angels, boots and slippers, Christmas trees and birds—whatever you want. Only there should not be any pieces protruding—the figures should be flat or they’ll burn. We always make a hole in the top for stringing them on the tree. After the baked cookies have cooled they can be covered with glaze made of powered sugar, and decorated with sprinkles. The children can do all this themselves, and they do it with enormous pleasure. If some of the cookies don’t come out—they’ve broken, the hole for the ribbon disappeared during the baking, or something else—this is not only not a disaster, it is even great. We set aside the rejects in a pretty vase. 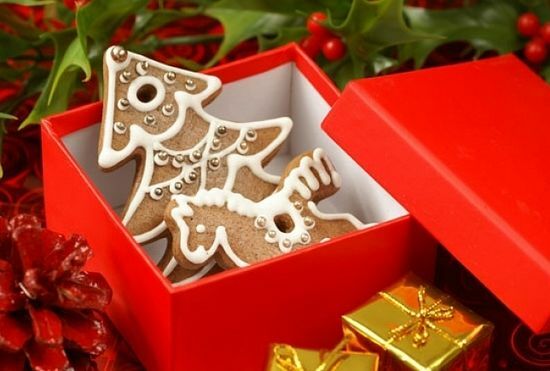 And on Christmas Eve, after eating the koliva, these cookies can be eaten with tea or compote. The good ones are hung on the tree or given as gifts to our friends and relatives. We also make gingerbread houses from the same dough, or from a base purchased at the grocery store. There are many different recipes. We have chosen one that is easy to shape. Here it is: We take 2 cups of flour, 2/3 cups sugar, 50 grams margarine, 1/3 cup water, 2 tablespoons honey, 1/2 teaspoon baking soda, 1/2 teaspoon cinnamon. Sift the flour, soda, and cinnamon. Heat the sugar, water, and honey until the sugar is dissolved, and cool to room temperature, add the margarine, add the other ingredients and mix the dough. Bake the cookies for eight to ten minutes at 221-220 C [410-428 F]. What else can you do before Christmas? A star on a stick for starring-caroling. Cut out of thick, non-corrugated cardboard an eight-pointed star. Paste it over with aluminum foil or white paper, which is then colored with gold or silver acrylic paint (crayon can streak in a snowfall). The finished star can be pasted with glitter, “icicles", or tinsel. Christmas tree ornaments made of walnuts. Take walnuts in the shell and wrap them in foil, or candy wrappers made of foil. Don’t forget to glue a string or ribbon inside to hang the nut with. The simplest Christmas tree decoration is bows made of ribbon. We can choose and make ourselves Christmas tree ornaments in the form of animals—the ones mentioned in the Bible—lions, unicorns, whales, or donkeys. We always read about them in the Biblical Book. This is also a part of the children’s education. You can use origami. Or, you can do it more simply: The children draw their animal on thick paper and cut it out. Photograph ornaments. For this we take a piece of thick cardboard, tinsel, ribbon, and photographs of the children (or pictures of churches, children’s drawings with magi, shepherds, or anything they like). Cut two identical circles (you can use a plate or can to trace them). Cut a circle out of the photographs the same size. Glue the photo to the face side of the cardboard. On the other side of one of the cardboard circles, glue tinsel and one end of the ribbon loop. Glue them together. You can give these photograph ornaments to grandparents, godparents, or hang them on your own tree. On the fifth of January we do the cleaning: vacuuming, washing the floors and mirrors. We can fix something to eat for Christmas, so that we won’t be at the stove so long on Christmas Eve. We make the drinks ahead of time. For example, deseed the lemons (or oranges), and blend the flesh in a food processor with sugar. On Christmas night all we have to do is mix this with water to get a very tasty and healthy natural lemonade. You can make some salads on that day that will not wilt or spoil. You can also peel the onions, garlic and whatnot that you’ll need for cooking on Christmas Eve. All this can be done together with the children. We try to prepare for Christmas night everything that can possibly be done ahead of time, so that Christmas Eve will be less fussy. If you spread the work out over several days, you can get more done, and there will be less probability of getting irritated because, “like always we can’t get things done in time!” We can hang out our clothes for Christmas midnight services, and iron the girl’s ribbons. On that night we can pour boiling water over the wheat berries for the koliva so we won’t have to boil it so long the next day. And now very soon, today, it’s Christmas! We lie down to sleep to rest before the night service. We read together the “children’s” prayers before Communion, and put the little ones to bed. They quietly fall asleep, while the parents continue their prayers aloud by candlelight, reading the canon for the Nativity. The adults also get to rest—after all, the work has all been done. It’s time to rise for the night service. We turn on the CD with carols and thus wake the sleepers. The children jump out of bed and rush to get dressed. This is the peak moment of childhood… But we won’t talk about that. This is Christmas, and not preparation for it. The preparations are done, the fast is over, and the Feast begins. When all the earth will sing unto the Lord, as it did two thousand years ago, and when people will sing in their gladness, we will also sing—our whole family together with our Church will sing the praises of the Newborn Savior of the world.